It’s always an interesting exercise looking back at your experiences and first interactions you have with people who eventually become friends. Recently I did this entirely on accident by casually roaming through the reviews I’d received early in my judging career. I took the time to open and read through a handful of them, in some cases giving me a laugh. Other reviews reminded me about some “oops” moments that now seem like elementary mistakes, like this one from an event where I tried to prioritize giving everybody experience and ended up giving nobody a full experience. With hindsight, I think it probably also would have been better for Patrick to have made the executive call to send a couple of judges home after the first round was underway. The event could have easily been run with a couple judges, so keeping an extra pair of judges around for five extra hours didn’t really make the tournament run any smoother. You first caught my attention shortly before GP Minneapolis when I saw one of your comments in the MTGSalvation forums…I got your name and location from your profile and signature and made a comment somewhere about hoping to meet you at the GP Minneapolis judge conference and one of our mutual friends introduced us. 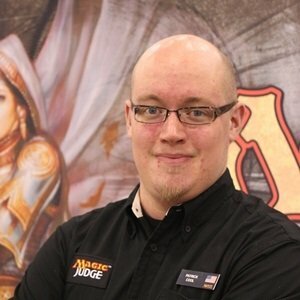 your rules knowledge (or possibly confidence in your own rules knowledge) was below par for what I would want to see from a Floor Judge at a Legacy GP. As Riki highlighted later in the review, rules aren’t my strength, whereas I might trend above average in soft skills. And rules knowledge is an area I still struggle with from time to time. But Riki also very helpfully explained what I did well. One area where you did display veteran skills was when you took care of Michael Jimenez, your floor buddy…He went on break shortly after that, and my understanding is that you talked to him over lunch and helped him regain his confidence. I remember being surprised by this part of the review: apparently taking care of your teammates isn’t just something everyone does? This was something that took a long time for me to really internalize. At that time, I couldn’t distinguish this ability from “normal operations,” or skills I might have assumed every judge would bring to an event. None of this detail and encouragement seems out of the ordinary from someone like Riki. What made the biggest impression to me was how this review gave me a snapshot, a photograph of me three years ago, to compare with my current performance to see how I’ve grown since January 2013. When an individual stares at someone or something excessively long, another person might comment, “Take a picture; it will last longer.” And in a way, I agree with this sentiment: if something is worth dwelling on, why not make it more permanent? Reviews provide a level of permanence to the program by offering a way to capture and remember a past version of who we were and what our skill set looked like. RIKI’S NOTE: When Patrick told me about his experience looking back at this review, I immediately pulled it up. It took me back to a simpler time and brought a smile to my face because it reminded me not only of the event in question but also of our years of friendship. Patrick was someone with whom I worked closely for several years, despite the geographical distance between us. A couple of years ago, at my manipulation urging, he and Joshua Feingold collaborated on an article about reviewing higher level judges. I’m glad that, more recently, an old review gave Patrick an excuse to reach out to me. Now here he is again writing something review-related. Some things never change.